Austria is a vibrant country with many cultural attractions, delicious food, and historic sites. When in the country, whether for a day, week, or month, you will have your choice of amazing hotels to choose from. Some are international chains while others are smaller Austrian brands. You can stay in a modern or historic building. Hotel Sacher Vienna is among the luxury hotels found throughout the world and it has hosted numerous famous guests over the years. Every single room includes international cable on flat-screen TVs, radios, DVD players, bathroom mirror TVs, iPhone/iPod docking, high-speed internet and Wi-Fi, modem and fax points, writing desks, 24-hour room service, phones, voicemails, safes, mini bar, bathrobes, toiletries, bathroom scales, individually-controlled air conditioning, windows that open, and pray rugs upon request. You can opt for one of several types of suites with even more amenities. 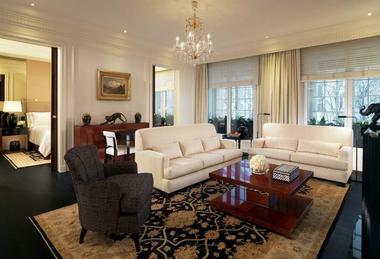 Those rooms can feature additional space, separate bathtubs and showers, under-floor heating, marble bathrooms, parquet wood floors, and/or fine wool rugs. Guests can enjoy daily maid service, evening turn down service, and personal wake-up calls. There is also complimentary access to the fitness facilities and the Sacher Boutique Spa. Or book a relaxing treatment in the Boutique Spa, the only of its kind in Vienna. The hotel additionally has 24-hour concierge service as well as babysitter service, limo service, and laundry, dry cleaning, and pressing. There are two restaurants to choose from, serving international and Austrian dishes, plus the Blaue Bar and cafes. Be sure to try the Sacher-Torte, the cake the hotel and restaurant is famous for, and has been since 1832. Green Spa Resort Stanglwirt is a luxurious resort and organic farm featuring a luxury five-star hotel. 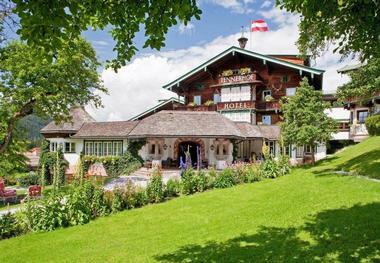 The hotel has been hosting guests for more than 400 years with its Tyrolean hospitality and top facilities. 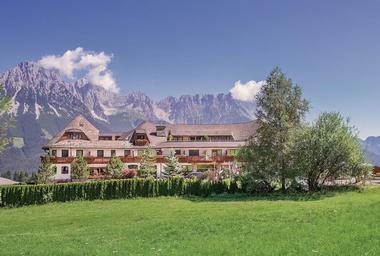 The resort has been family-run since 1722 and delivers uninterrupted views of the Wilder Kaiser mountain range. All rooms feature Arolla pine wood and are made with traditional building methods. Expect terry towels and bathrobes, solid wood furniture, top-quality sheep-wool carpets, and fine linen sheets and quilt covers. All accommodations have flat-screen TVs with ONEVision TV and Wi-Fi, Nespresso coffee machines, and terraces or balconies. The entire property covers more than 12,000 square meters, including a sauna complex, water worlds, and more. Relax in the rock pool, saltwater pool, panoramic relaxation areas, waterfall grotto, or organic pine-clad sauna. The water worlds include one for children with a 120-meter-long water slide, pools for toddlers and babies, and the very first pool cinema to be at a hotel. Other amenities include the eight outdoor tennis courts, six indoor tennis courts, and the riding school. The restaurant serves home-grown culinary delights, including the hotel’s own cheese from its dairy. Get a drink at the Auf der Tenne hotel bar or dine at the 400-year-old Gasthof Stanglwirt. You can also get a snack at Kamin Bistro. 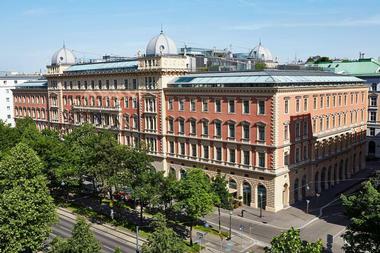 Palais Hansen Kempinski is heritage-listed and right by the famous Ring Boulevard. It was first built for the 1873 World Exhibition and has contemporary design, luxury, and modern features. There are 152 rooms and suites to choose from along with seven conference rooms, a flower shop, and a ballroom. Rooms have laptop-sized safes, working desks, Nespresso machines, flat-screen TVs, entertainment centers, bathtubs, and showers. There are also spacious suites available. Unwind at Kempinski the Spa on the mezzanine with 800 square meters. This is also where you will find the wellness area with a modern gym, hydro pool, saunas, and six treatment rooms. There is also limo service and available extras like flowers. Choose to dine in the two restaurants, get a drink at the two bars, or relax in the cigar lounge. Die Kueche Wien serves all meals with classis Viennese dishes and a laid-back atmosphere while EDVARD is a Michelin Star restaurant. The Lobby Lounge & Bar is famous for its apple strudel while 26 East has creative cocktails. 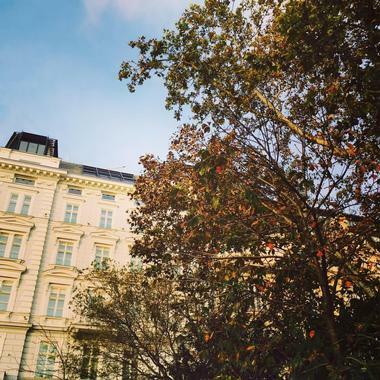 The Hotel Sans Souci Wien delivers an urban retreat in the heart of Vienna, right next to the Museum Quarter. All accommodations include 24/7 coffee service, free wireless internet, bottled water, pillow menus, tea stations, fluffy bathrobes, slippers, make-up mirrors, luxury Molton Brown products, hairdryers, phones, satellite and Pay TV, radios, daily newspapers, large desks, mini bars, safes, air conditioning, and irons. There are family rooms and connecting doors available. Guests can enjoy the Sans Souci Spa, including the Sport Pool, the Sun Meadow, the individual treatment rooms, and the sauna. There is 24/7 concierge service as well as shoe shining. Start the day with the champagne breakfast. Get a drink at Le Bar or have a relaxed meal at VERANDA. Tennerhof Gourmet & Spa de Charme Hotel is a luxury hotel that is the most romantic as well as smallest 5-star hotel within Kitzbuehel. The hotel sits on a hillside and is privately owned. There are 39 rooms and suites, all with family antiques. Or you can stay in one of the three Tennerhof Luxury Chalets. All accommodations are unique but with intimate charm and modern comforts. They all have two bottles of water, free wireless internet, phones, safes, towels, cosmetic articles, make-up mirrors, TVs, slippers, bathrobes, and hair dryers. Relax at the award-winning Spa de Charme, where you will find the indoor and outdoor swimming pool, steam bath, saunas, and two modern relaxation rooms. The outdoor pool is surrounded by ancient fruit trees and a garden. You will also find free parking, shoe polish service, a shuttle service, and daily newspapers. The hotel also helps you arrange daily activities, like hiking or skiing. Dine at one of the three restaurants. Kupferstube is the Gourmet Restaurant and is regularly listed among the country’s best. Enjoy a gourmet buffet breakfast to start off your day. There is also a hotel bar with fresh coffee and homemade cakes in the afternoon. Hotel Goldener Hirsch is currently undergoing renovations and sits on the renowned Getreidegasse Road. There are 70 guest rooms as well as suites to choose from. All have authentic décor in the Salzburg style, including items handpicked by Countess Harriet Walderdorff. The 65 guest rooms and four suites combine antique furnishings, historic décor, and modern amenities. All rooms have individually-controlled air conditioning as well as nightly turn down service. Rooms also have complimentary hotel magazines and newspapers, slippers, and plush robes. Other amenities include lighted makeup mirrors, hair dryers, bathtubs, chairs, safes, desks, alarm clocks, TVs, phones with voicemail, and mini-bars. Guests and locals alike can dine at one of the two authentic Austrian restaurants at the hotel or get a drink at the hotel’s bar. The restaurant has been serving Austrian dishes since 1407. The Restaurant Goldener Hirsch delivers a fine-dining experience and a comprehensive wine cellar. Restaurant Herzl has a more intimate atmosphere and casual dress code. The Bar Goldener Hirsch features a covered inner courtyard for extra character. 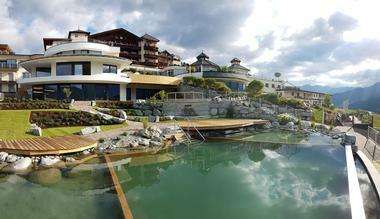 STOCK Resort is a five-star resort that is family friendly and in Tyrol. It is great for those who love sports or spas and is family-run. Each room has its own personality and there are 12 Alpine Lodge family suites which are new. 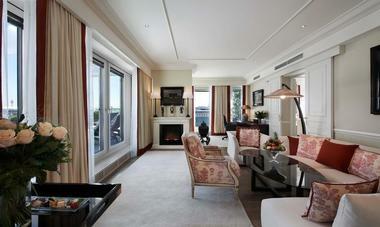 Every room has state-of-the-art comfort and panoramic views. Other amenities include Nespresso coffee machines and free WLAN. Visit the Wellness & Spa area with its 5,000 square meters, 25-meter sports swimming pool, outdoor pool, indoor pool, mountain lake, and total of 12 water areas plus 11 saunas. There are also children’s programs. You can also enjoy yoga in the Energy Room or get in a workout in the 190-square-meter panorama fitness studio or borrow a walking or biking guide. Enjoy any meal, including an exclusive 6-course dinner or a lunchtime gourmet buffet. Those meals, and a buffet breakfast can be part of the wellness package. The resort also has an extensive range of high-quality wines. 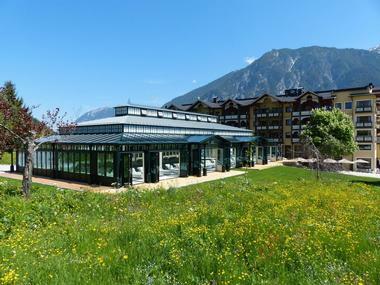 Interalpen-Hotel Tyrol delivers breathtaking landscape and plenty of indoor and outdoor activities for guests to enjoy. This luxury hotel has multiple room types, including suites with as much as 120 square meters. All rooms have dressing rooms, living areas with tiled stoves, balconies, bathrooms with separate showers and tubs, bidets, hair dryers, internet, minibars, safes, hair dryers, and TVs with pay TV and radio. Visit the wellness center with its 5,300 square meters, including a newly designed Tyrolean sauna village with traditional wooden roofs on huts with a range of saunas. A shuttle service is included for the convenience of guests. While the adults enjoy activities, the kids can attend the children’s activities, including at the Interalpen Playground with a water and sand area, aerial cableway, and untreated materials. Or they can enjoy nature workshops and more. Guests of all ages will appreciate easy access to skiing, yoga, hiking, golf, Nordic Walking tours, and more, depending on the weather. The hotel also has a fitness room. Enjoy delicious meals that include ingredients from the hotel’s herb garden and make use of the Chef’s Table. Guests get an extensive breakfast buffet, a formal dinner on Sundays, and a 6-course a la carte dinner menu. 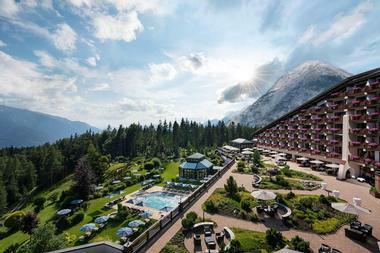 Das Central was the very first 5-star hotel in Soelden in Tyrol and is the longest-running. 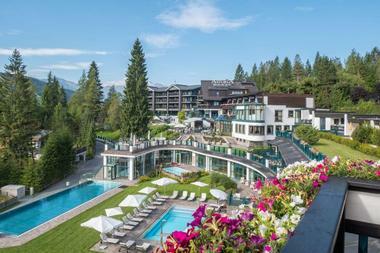 It delivers “toque”-awarded gourmet cuisine, casual luxuriousness, Tyrol cordiality, and spa artistry. There are 125 double rooms as well as suites to choose from. All accommodations have BIONIC healthy sleep systems and eiderdowns with high-quality mattresses with plenty of pillows and cushions. There are numerous room and suite types, with standard amenities like flat-screen TVs including international programming, free internet, private safes, a digital Concierge, phone, a minibar, a hair dryer, a makeup mirror, a bathroom scale, fluffy bathrobes, bath slippers, a Saloman hiking backpack, and organic Valentina & Philippa Kaufmann bath amenities. Relax or get in a workout at the wellness center. There are ten saunas and steam baths, as well as beauty treatments, massages, and various other treatments for serenity and tranquility. There is also an indoor pool with an authentic Venetian gondola and a 120-square-meter fitness center. Enjoy seasonal adventure programs like guided ski safaris or hikes, yoga, and mountain breakfast. Enjoy award-winning meals from the DAS CENTRAL kitchen. All guests are treated to a luxury breakfast buffet and a dinner par excellence with a 5- or 6-course gourmet menu. There is a weekly gala dinner. Reiters Supreme Hotel delivers a comfortable and casual experience where you can also explore new adventures. This is an adults-only hotel. Rooms have sweet welcomes, flip-flops, sauna towels, bathrobes, bathroom radios, flat-TVs with Sky, high-quality bedding, goose feather and down bedding, maco-satin linens, pillow menus, Wi-Fi, and turndown service upon request. The hotel has nine pools, 27 holes of golf, sport activities, and spa treatments. The spa landscape includes 8,200 square meters, with 3 Water Worlds (fresh water, thermal water, and thermal brine), pools, saunas, and steam baths. Visit the Reiters Finest Beauty or Merkur Lifestyle Spa to get pampered. Those who want to stay active can participate in the over 40 activity programs that are included with your stay. Guests can also visit the animal garden with its over 250 animals, and enjoy amenities like complimentary Wi-Fi, free parking, e-charging stations, live music, welcome champagne, and guest laundry. The retreat itself covers 120 hectares with plenty of trails. You can also choose to go horseback riding. In terms of meals, enjoy a bathrobe breakfast or a breakfast buffet, lunch, 5-course menu, lounge for smokers, a gala menu, a sweet market, and a cheese buffet. 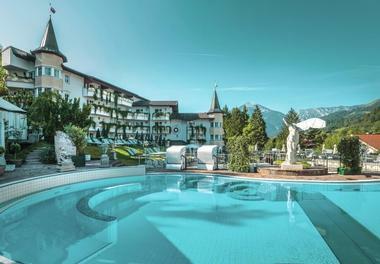 The Grandhotel Lienz opened in 2009 and is filled with luxury, including tastefully designed rooms and suites. There are multiple room types to choose from, all with slippers, fluffy bathrobes, a wellness bag including towels, sparkling wine upon arrival, free Wi-Fi, a minibar, a coffee machine, and a safety deposit box. Guests can use the Wellness, Spa, and Fitness area which spans 1,400 square meters and includes a relaxation room, outdoor and indoor relaxation pools, and a generous sauna area. There are four saunas as well as steam rooms with unique features and temperatures. Enjoy the complimentary shuttle service to the nearby golf course and ski resorts. Or stay on site to explore the terrace and gardens. Guests are treated to an extensive breakfast buffet and can access a Vitality and Tea Corner. The wellness area also has fruit juices and tea. Or just head to the hotel’s gourmet restaurant for any meal of the day. Choose from the five salons or the Lounge or Hotel Bar. Sitting at the foot of the Wilder Kaiser, this family-run hotel has luxurious rooms and suites as well as an extensive spa and wellness area. The 38 rooms and suites are unique, each with its own charm and design concept. Expect room amenities like mini bars, safes, TVs, phones, bathrooms, CD players, bathrooms, beauty baskets, large balconies, and hair dryers. The location of the hotel lets you ski in and out onto the slope; there are ski lockers for convenience. Or just sit outside on the panorama terrace. Get pampered in the spa area, PurPur. Or use the cigar lounge, cozy lounge with its open fireplace, or Kids’ Club “Chili.” Other amenities include guided adventure hikes, daily activity and fitness programs, a family steam bath, and a panoramic swimming pool. Meals in the restaurant are supervised by an award-winning cook, with a daily six-course meal and gourmet breakfast buffet plus snack buffet. Dine at one of the five non-smoking restaurants to enjoy award-winning cuisine. Finish the day with a drink in the Kaiser Bar. Hotel Schalber pampers its guests with understated luxury and refined elegance. This family-friendly hotel has amenities for the entire family regardless of the time of year. You can choose from single or double rooms, apartments, suites, or family suites. Even the basic rooms have baths, seating areas, balconies, safes, flat-screen TVs, and phones. Most rooms also have minibars and many are also dog-friendly. The wellness, bathing world, vital, and spa area covers about 4,000 square meters and is surrounded by panoramic views. Here, you will find the indoor pool, sauna, indoor wellness pool with an outdoor basin, the salt-water pool, the ice grotto, the herbal steam bath, the Tyrolean sweat lodge, the rock sauna, the Asian steam bath, and the salt inhalation grotto. Enjoy the family sauna, children’s swimming pool, childcare, indoor pool complete with waterslide, and the Schalber Fun & Action Area. The last of these includes a range of indoor activities, such as a tightrope garden, suspension bridge, and miniature golf. There is also a supervised fitness room and indoor/outdoor tennis courts. Hotel Fliana delivers activities or relaxation, personal dedication, and culinary sophistication. There are multiple room types to choose from, all of them with great standard amenities. Expect a bathroom with shower, a balcony, a TV, a safe, a phone, a minibar, slippers, terry robes, and a hair dryer. Upon arrival, you get a welcome drink. Guests can go skiing, cycling, or hiking right from the hotel. Enjoy the Fliana Wellness & Relax world with its five types of steam baths and saunas. There is also a 13-meter lap pool, a sunbathing lawn with an outdoor pool, private ski lockers, and a playroom for teens and kids. There is also a new apres ski lounge with music and socialization. Enjoy authentic Tyrolean hospitality and a modern ambiance at the hotel’s two restaurants. 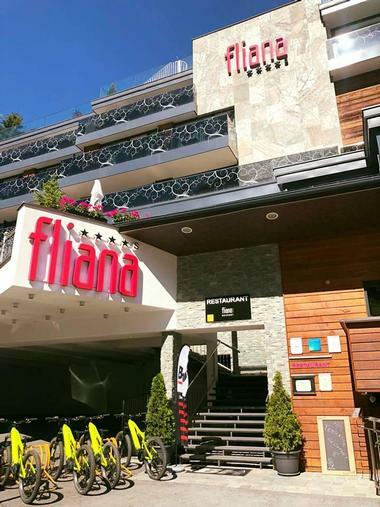 Or get a drink at the Fliana Lounge or Hotel Bar, with a cozy fireplace. Guests are treated to a daily breakfast buffet in the morning and a 5-course choice dinner menu in the evening. The summer also features an afternoon buffet with snacks and pastries. There are weekly gala dinners as well. Stop by the wellness bar in the Relax World for snacks like fruit and cold drinks. 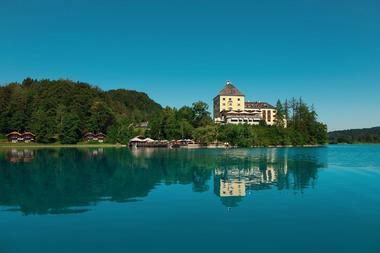 The Romantik Hotel der Wiesenhof sits on Lake Achensee and delivers relaxation. There are various room types, including single rooms and suites. Even single rooms have maple wood furnishings, Grand Lit, showers with toilets, balconies, room safes, sauna baskets, bathrobes, cosmetic mirrors, hair dryers, Tiroler Steinoel products, herbal cushions, HDTVs with radio, phones, free WLAN, and fridges. Many rooms can also connect. You get a welcome drink upon arrival. Baby amenities are also available upon request, including chairs, monitors, cots, and more. Regardless of the time of the year, there are numerous outdoor activities, such as wind surfing, sailing, golfing, hiking, riding, cycling, paragliding, swimming, motor cycle riding, climbing, stand-up paddle boarding, cross-country skiing, and more. Use the KARWENDEL SPA with its 2,300 square meters, including a swimming hall, saunas, and relax pool or get in a workout at the cardio fitness center or Dr. Wolff prevention park. There is also an activity program and guests can borrow bikes, toboggans, bikes, hiking maps, and more. There is also storage for bikes and skis. Accommodations are luxury half board, meaning that you get to enjoy meals nearly any time of the day, including breakfast, a late breakfast, a lunch/afternoon buffet, a 5-course dinner, and a small dinner. 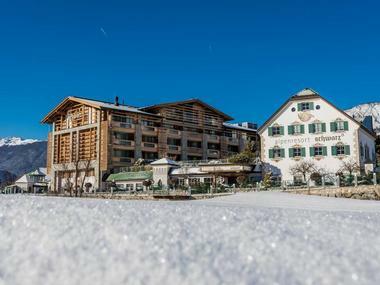 Alpenresort Schwarz sits on Mieming Sun Plateau, and has activity breaks and a spa for all ages, year-round. Choose from double or single rooms, family rooms, or luxury suites. All accommodations include amenities like radio-TVs, mini bars, sitting areas, writing desks, wooden floors, air conditioning, lounge-balconies, separate WCs, and bidets. 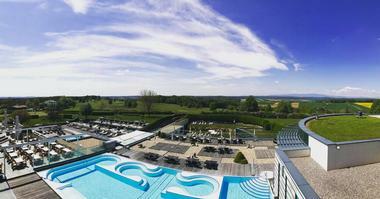 The property has 32,000 square meters of grounds recognized as the most beautiful hotel garden in the country. The spa and water worlds cover 5,500 square meters, including state-of-the-art furnishings from natural materials and modern architecture. There is a Sauna Village with seven heat and sauna cabins plus a modesty “textile” sauna. The Schwartz Water Worlds has nine pools, including sections for families and just adults, the former of which includes a whirlpool and 92-meter slide. There is an all-day children’s program with activities like an adventure playground and petting zoo. All guests can hire sports equipment, use the fitness center, participate in guided activities, and play tennis. There are eight comfortable rooms as well as themed areas in the restaurant, including a separate family area. All stays include a breakfast buffet, lunch buffet, themed buffets and dinners, gala nights, cakes and snacks in the afternoon, fruit during the day, a spa bistro, and takeaway drinks. Hotel Alpenhof Hintertux is a four-star hotel with a family atmosphere, extensive wellness area, exquisite cuisine, and state-of-the-art furnishings. 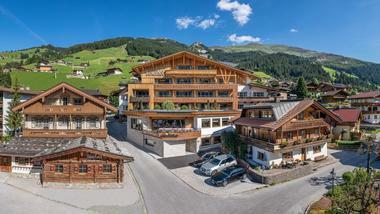 Expect amazing views of the Hintertux Glacier with a range of rooms and suites to choose from. You will get amenities like balconies, phones, flat-screen TVs, Wi-Fi, radios, and shower/toilets at a minimum. You can also enjoy hair dryers, makeup mirrors, body lotion, cosmetics, anti-allergy bedding, safes, SPA bags, WLAN, and mineral water. Make use of the 2,600-square-meter Wellness Zone, which includes the 1,000-square-meter alpine garden, 1,600-square-meter Vitalis Spa, heated XXL outdoor whirlpool and sundeck, indoor swimming pooler, multiple saunas and steam rooms, separate children’s pools and family steam rooms, panorama relaxation rooms, and access to beauty treatments or massages. The XXL sports hall has spaces for yoga, basketball, volleyball, children’s Olympic games, and more. Or work out in VITALIS FIT. Be sure to check the hotel’s activity program for organized activities with experienced guides such as group hikes or skiing. The VITALIS bar has water, fruit juice, and tea. The hotel’s restaurant serves ingredients grown on its own farm, including fresh meat and dairy products, as well as regional businesses. 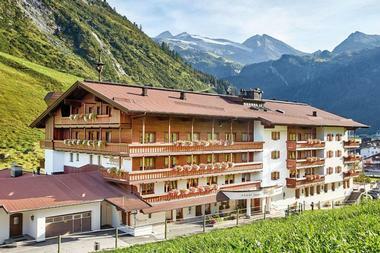 The Tuxerhof sits by the entrance to the Tuxertal Valley, at an elevation of 1,300 meters above sea level. Guests are treated to Tirolean hospitality with a stylish ambiance and excellent service, and have been since 1930. All suites and rooms have new furnishings to fit the Alpine lifestyle. There are 110 beds in lovingly and elegantly appointed rooms. The 54 suites and rooms have high-quality materials and a range of suite sizes to choose from, accommodating groups of varying sizes. All accommodations have balconies, Sat-TVs, bathrooms with showers, WCs, cosmetic mirrors, hair dryers, toiletries, wellness bags, Wi-Fi, apples and mineral water, a hot-water bottle, and more. Those who want more privacy can opt to stay in an apartment instead. The spa and sauna facilities cover 2,000 square meters. You will find seven themed saunas, an indoor pool, a whirlpool, three saunas, fresh air grottos, and relaxing spaces. There Well Beauty Center features massages and cosmetic treatments. The property is all-inclusive, including daily morning post, tips, evening entertainment that includes live music, wine tasting, and a welcome sparkling wine with an informational evening. Enjoy a breakfast buffet, afternoon snacks, homemade cakes, organic teas, non-alcoholic drinks, a six-course gourmet dinner with weekly events, and drinks and fruit in the SPA area. 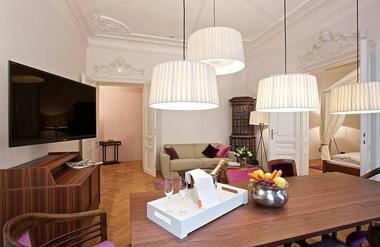 The Hotel Bristol Vienna is part of the Luxury Collection and is in the heart of Vienna. The building has stunning art deco design and has been a favorite in the area since 1892, offering 24 unique suites and 150 exclusive rooms. In-room amenities include marble, Wi-Fi, high-speed internet access, classic armchairs, CD players, 32-inch flat-screen TVs with cable and movies, Luxury Collection bath amenities, hair dryers, slippers, plush bathrobes, elegant desks, sofas, safes, mini bars, air conditioning, and sometimes walk-in closets. Get in a workout in the fitness center with its high-tech exercise equipment and amazing views. Enjoy all-day dining in the Bristol Lounge, which has a fireplace and serves traditional Austrian recipes along with international classics. The Bristol Bar was the city’s first American bar. 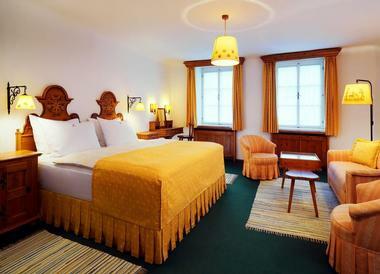 Hollmann Beletage Hotel is a boutique hotel in the center of Vienna for convenient access to local attractions. There are 26 spacious rooms in the 19th-century building, able to fit up to 52 guests. This delivers a smaller feeling and more personalized service with the 25 rooms and single suite. All accommodations have ARGAN toiletries, including shampoo, shower gel, conditioner, and body lotion. They also all feature sauna towels, air conditioners, hair dryers, slippers, bathrobes, LCD flat-screen TVs with cable, free internet, phones, minibars, safes, and JBL mini speakers and iPads upon request. Enjoy access to the spa with its treadmill and sauna, the library with CDs and books, the cinema, and the newspapers and magazines in the living room. Enjoy a daily assortment of fresh fruits in your room for your convenience. Enjoy breakfast upon request in your room or a buffet breakfast, as well as afternoon snacks for free. The deli always has free homemade snacks as well as tea. Visit the Delicatessen for a delicious meal or snack. The Hotel Post Bezau combines culture, nature, indulgence, and wellness and is currently in its fifth generation of family management. There are 58 rooms and suites, each with its own unique decorations and plenty of natural materials like those found in the area, such as leather, hand-woven linen, wood, and felt. All rooms have Grand Lit, bathrooms with tubs or showers, parquet flooring, TVs, safes, desks, and minibars. There are also suites and more spacious rooms available. Visit the Susanne Kaufmann Spa for relaxing treatments utilizing the spa’s skin and body care lines, including TCM Detox, Body Rejuvenation, and Natural Anti-Aging. There are also retreats, including Body Shaping and Yoga. 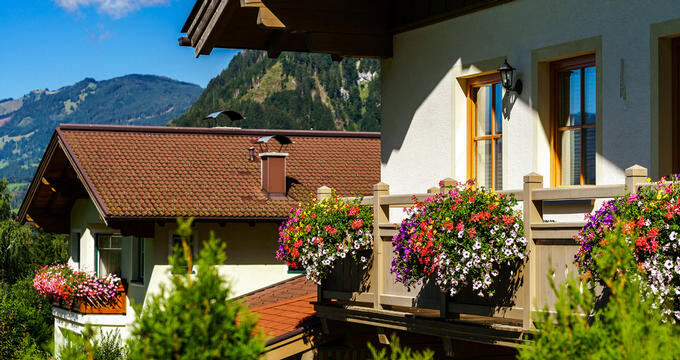 The location of the hotel makes it easy to explore Bregenzerwald, with skiing, mountain biking, and hiking. Or stay on site and use the spa and wellness area or access the free Wi-Fi. Make use of the daily free activity program and 24-hour fitness center access. You can also rent mountain bikes or toboggans for free. Other activities include tennis, skiing, mountain biking, cross-country skiing, mountain hiking, ice skating, and more. Explore by yourself or join one of the programmed activities. The Hotel Post Premium Board includes a buffet breakfast featuring regional dishes, a cozy afternoon snack buffet, and a four-course gourmet evening menu. Meals are prepared with natural, regional ingredients. Schloss Fuschl delivers views of Lake Fuschl and was built in 1450. Now, it serves as a Luxury Collection Resort & Spa with easy access to the area’s outdoor activities. There are 110 guest rooms plus luxury suites and lakeside cottages, all of which combine Old European charm with modern opulence. All rooms have complimentary bottled water, coffeemakers, alarm clocks, air conditioning, electrical adapters, down/feather and foam pillows, irons, pull-out sofas, safes, hair dryers, separate tubs and showers, bathrobes, color TVs with satellite/cable, fireplaces, and complimentary mini bars. Kitchens feature fridges, silverware, dishwashers, tables, and chairs. Guests can easily go swimming, attend a vintage car rally, golf, or go hiking from the hotel. There is a jogging/fitness trail right there as well as a sauna, solarium, mini golf, kayaking, fly fishing, boating, and more. The wellness spa, Schloss Fuschl Spa, delivers rejuvenation and relaxation. Swim in the pool or use the whirlpool. Other amenities include a fitness center, newsstand, concierge, limo service, newspapers upon request, safe deposit boxes, valet dry cleaning, daily housekeeping, a shoeshine stand, and babysitting. Dine in the on-site restaurants, including Schloss Restaurant with Austrian and French dishes. Posthotel is an adult resort with five stars and a spa. It sits along Lake Achensee for magnificent views. There are multiple rooms and suites to choose from, with seating areas, bathrooms with double vanities, showers, phones, and more. Or select a room with separate WC, terrace or balcony, display fireplace, melanin stimulating lights, or other amenities. The SPA area spans 7,000 square meters, including indoor and outdoor areas for naturists and a sauna world. The Atrium Spa is the perfect place for beauty and cosmetic treatments for your body and face, plus TCM, couples’ treatments, baths, massages, and Ayurveda. Attend the supervised relaxation and exercise program. Attend a seminar on yoga, fitness, or nutrition. 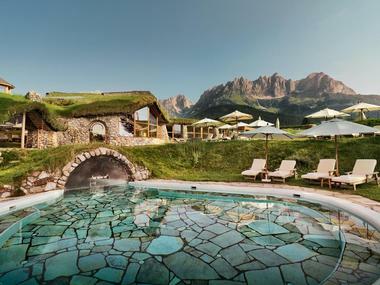 The property also has its own Alpine golf course, a pasture hut, the largest private Lipizzaner stud in Europe, its own farm, and an Asian-inspired sunken temple. Enjoy activities like tennis, horseback riding, fitness, and yoga as well as nearby outdoor activities. All meals are gourmet and can be accompanied by fine wines from the hotel’s cellar. The cuisine is regional and sustainable. All guests get to enjoy a breakfast buffet, a Vital-Lunch in the BISTRO, multi-course choice menus and a dinner buffet or a la carte dining from TENZO and Gaststube. Astoria Resort has award-winning cuisine, a spa area, and luxurious rooms. The hotel is dog-friendly and even lends guests dog equipment like bowls, towels, and waste bags. Enjoy turn down service every evening and fresh flowers in the 82 rooms and suites. There is complimentary Wi-Fi and a tablet with over 800 newspapers. Rooms also have bags for spa trips, bathrobes, slippers, hair dryers, minibars, and safes. The resort is expansive with 20,000 square meters outdoors and 2,000 square meters indoors. You will notice interlinked pools, a fitness area, beauty and cosmetics, and a Day Spa. Other on-site amenities include the outdoor panoramic pool, the heated indoor pool, natural swimming lake, the Astoria Alpin Aktiv Spa, spacious saunas, large relaxation spaces, a private spa, a Spa Reception, rain showers, a large steam bath, a fitness room, space for yoga and gymnastics, and daily activities like Nordic Walking, Pilates, cardiotraining, Qi Gong, Aqua Gym, gymnastics, guided sauna sessions, and guided hiking tours. Enjoy award-winning gourmet half-board, with a 7-course menu as well as a breakfast buffet. There are weekly gala dinners as well as themed buffets, teas all day long, light lunches, afternoon cakes, and live piano music in the restaurant or bar. 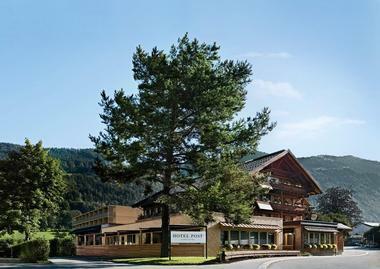 Hotel Klosterbräu and Spa delivers a YOUNIQUE experience to appeal to each individual guest. There are 35 new Lifestyle rooms and suites with amenities like bathrooms, WCs, safes, mini-bars, flat-screen TVs, radio/CD players, hair dryers, direct dial phones, soft bathrobes, Nespresso coffee machines, and convenient locations. Childcare facilities are available, including a children’s playroom and outdoor playground and dogs are welcome as well. Guests have access to the 3,500-square-meter Spiritual SPA, with its seven themed saunas, four water areas, including a year-rounded heated outdoor pool, heated indoor pool, and whirlpools. There is also a Private SPA, a Garden of Eden for sunbathing, and six rest and relaxation zones. Other wellness and SPA services include Mental Coaching, yoga, Pilates, a panoramic gym, meditation, and Lebensfeuer kinesiology analysis. The hotel also has a Kaennchen DancingBAR, concierge, valet service, experience program, VIP Shuttle Service, board games, and reading material. Upon check-in, you receive a welcome drink and you can enjoy apples, apple juice, and water in your room plus a welcome aperitif. Enjoy a gourmet breakfast buffet, fruit and vitality corner, beer tastings, wine tastings, and the vitality gourmet board with the Ritter-Oswald Stube or Gewoelbesaal. There are cheese and salad buffets plus festive menus. Or visit one of the restaurants, Vital-Bistro and Bräukeller & Grill, the steakhouse.